§ Plus 0% on new purchases for 6 months! Isn't it funny how easy it is to become weighed down with too many credit cards? Take a quick look at your wallet or purse. Chances are you've got more than a few high-interest store cards or credit cards with long-expired "special offers" taking up space and cluttering your life. Why not cut the clutter? Simplify your life and replace that pile of dodgy plastic with Barclaycard. Barclaycard gives you a very competitive ongoing rate of just 8.9% APR typical variable, a vast array of convenient features, plus the international acceptance of Barclaycard. Plus, you could save money on everyday shopping when you switch to Barclaycard, because we'll give you 0% on purchases for 6 months. And you could save even more with 5.9% on balance transfers. That's a great rate and it's yours for as long as you need it — another good reason to say goodbye to those high-interest store cards. Get a dependable card you can use everyday. But hurry, because while the benefits of Barclaycard last forever, the 0% on purchases for 6 months offer is only around for a limited time. The application form takes only a few minutes to complete. Why not apply today? 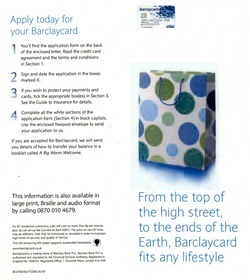 From the top of the high street, to the ends of the Earth, Barclaycard fits any lifestyle. Switch to Barclaycard and take advantage of this limited-time offer — 0% on new purchases for a full six months! We've teamed up with some of the UK's biggest names to give you a huge range of offers and discounts. Save with great deals from Avis, Center Parcs, Blockbuster, Ticketmaster and many more. Check out www.barclaycard.co.uk/deals for the full selection. · Barclaycard is accepted anywhere you see the VISA sign. No card is accepted in more places, for more things, than your Barclaycard. · If things go suddenly wrong, if you've lost your passport, need a doctor or an emergency flight home, we're here to help and just a phone call away. · Pay no credit card fee and save at least 7% on holidays with more than 150 tour operators when you book through Thomas Cook. · Free single trip travel insurance for up to five people when you book through our Travel Service (terms, and conditions apply). · Cover from just £29 a year. · Report lost or stolen cards with just one phone call any time day or night, 365 days a year. · Cover if anyone uses your Barclaycard fraudulently. · Pays 10% of your outstanding monthly balance for up to 12 months if you're unable to work due to illness, accident or unexpected involuntary redundancy. · Just 79p for each £100 of your monthly balance. You'll find the application form on the back of the enclosed letter. Read the credit card agreement and the terms and conditions in Section 1. Sign and date the application in the boxes marked X. If you wish to protect your payments, tick the appropriate box(es) in Section 3. See the guide to insurance for details. Complete all the white sections of the application form (Section 4) in block capitals. Use the enclosed freepost envelope to send your application to us. If you are accepted for Barclaycard, we will send you details of how to transfer your balance in a booklet called A Big Warm Welcome.